It’s only natural that odours and vapours build up while you’re cooking in the kitchen. But do you really want them hanging around? A high performance Neff cooker hood will instantly remove any odours or vapours from your kitchen, leaving it feeling and smelling fresh and clean. So, whether you’re looking for a chimney cooker hood, a canopy hood, a telescopic cooker hood, or a visor cooker hood, in stainless steel, black, silver, white, or even stainless steel and glass, our range of Neff cooker hoods could be just the ticket. Neff hoods offer a wide range of features such as easy-to-use push button controls, integrated LED lights, boost modes, high-performance motors, easy-to-clean grease filter cassettes, and more. And, with a whole host of designs and finishes to choose from, there’s sure be one that suits your needs and sense of style, while fitting in with the rest of your appliances effortlessly. 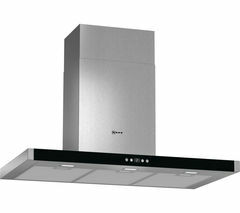 Our range of cooker hoods includes Beko, Neff, and Baumatic cooker hoods. 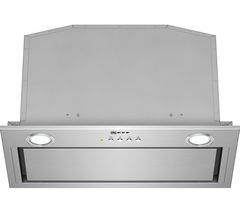 We also stock a large range of AEG, Britannia Living, and Belling cooker hoods.